Finishing up a print for the Hot-N-Ready portfolio exchange organized by artists Nathan Pietrykowski and Robyn Wall. Check out their work. Printmakers are constantly balancing projects with daily routines. The processes and techniques we use have numerous steps so we find ourselves filling time while waiting on acids to etch or emulsion and grounds to dry. We often adopt habits and rituals to stay focused and energized throughout the long work days. Creative scheduling maximizes our use of time. Emails are answered while eating lunch, “social time” is planned weeks in advance, while days off from our job(s) becomes time to work in the studio. Breaking up the cyclical nature of routines can reinvigorate us to forge ahead. These habits come in many different forms and are uniquely our own. For some of us a cup of coffee, favorite album or cheap greasy pizza is all that is needed to feel recharged. Artists are encouraged to create a print about how they stay motivated through tedious tasks in their studio practices or daily obligations. This portfolio is a survey of what keeps us Hot-N-Ready. I realized shortly after that I have a studio practice that had developed around my work schedule and obligations. 10 months out the year I’m on the go running, emailing, traveling around Nashville on errands for work. The majority of my time during awake hours is spent maintaining my work building (the various studios in the building), corresponding with various offices on campus regarding some new policy or changes to existing protocol. When I do find time to make art, it’s all contingent on when the studio is available. I work in academia, and the studios here at work offering presses, abundant amounts of ink, a fully equipped computer lab, large format digital printers, etc. all at my disposal…when students aren’t utilizing them. I have to navigate around a hundred students coming in to work at all hours of the day, this doesn’t include the times I am asked for help, and without realizing it, I’ve spent hours helping a student after I clocked out. This print is about what I have done between the times I have full studio time to myself, this year, to keep my self productive. I made things. I haven’t done much research for a series of works as I did as a student. I don’t need to prepare for an oral defense or finish a thesis paper like in grad school. To grasp with that uncertainty of not knowing what to do, I just made things to keep my hands busy and to keep my mind focused. Whether it’s drawing, troubleshooting and testing out new processes and equipment, I realized this year, I have to keep making things. That’s what this print is about. I used equipment to produce the plates and screens with the stipulation that I had to use equipment available at work I have not used once since I arrived. In this case, screen print and the laser cutter were my options. 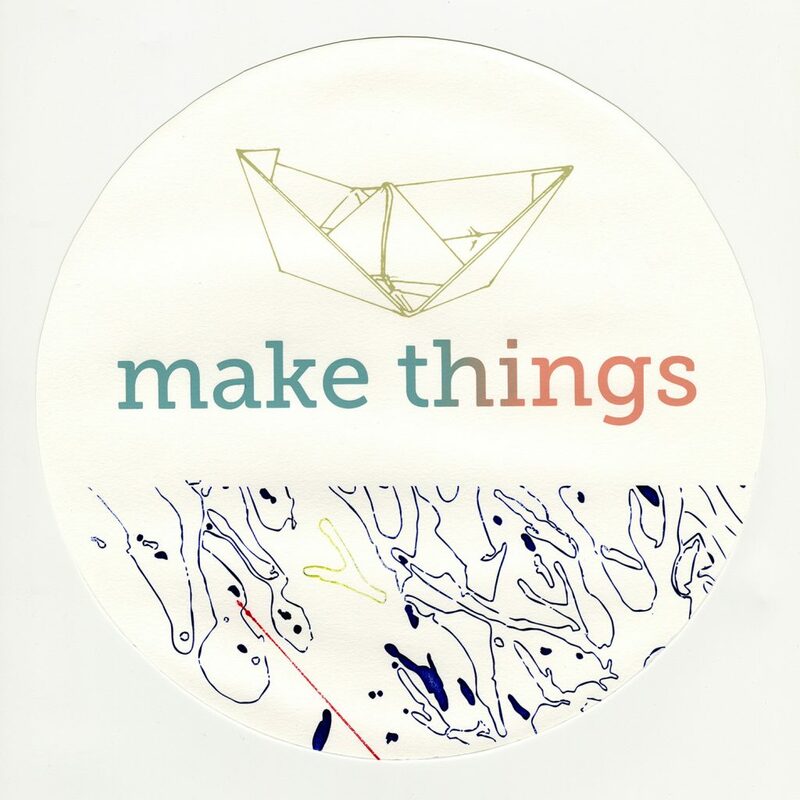 “Make Things,” 2016. laser etch on plexiglass with screen print on paper. 11in x 11in. diameter: 11in.